Budapest is famed for its stunning architecture, ruin bars and pubs and of course, its offering of thermal baths and spas. The Hungarian capital city also has so many things to see and do, that it's a good idea to invest in a Budapest Card. Gellert Baths are a hugely popular tourist attraction for millions of people visiting Budapest each and every year, as well as for locals who enjoy frolicking in the thermals baths before and after work. 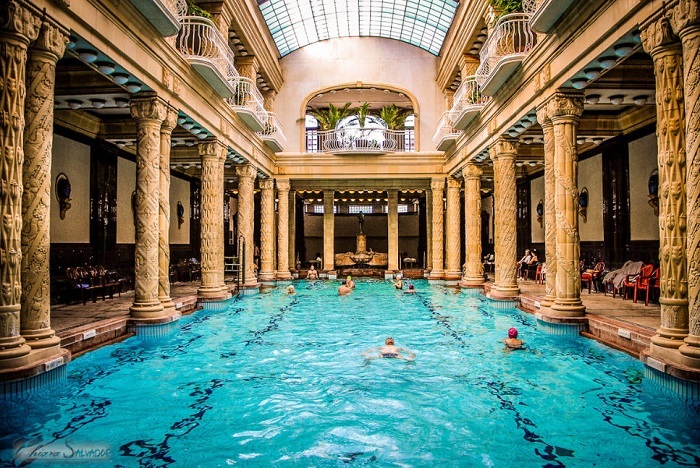 This guide will show you everything you need to know about the Gellert Baths in Budapest. What Are The Gellert Thermal Bath In Budapest? The Gellert Baths are part of the famous Gellert Hotel in Buda and are beloved for their wonderful thermal spring spas and swimming pools. Opened in 1918, the Gellert Baths are incredibly popular with both locals and tourists due to their spectacular spa facilities, medical treatments and relaxation centre. At the Gellert Baths, you can enjoy a vast range of treatments in their spa and wellness centre, as well as enjoying time in the many swimming pools. Their medical services are some of the very best in Budapest and you can enjoy a range of treatments including physiotherapy, sludge treatment, electrotherapeutic procedures, plus much more. The temperatures of the baths range from 19°C (immersion pools) to 40°C (for the indoor thermal pools). There are four thermal indoor pools and two immersion indoor pools, as well as 1 wave pool, 1 outdoor thermal pool and 1 swimming pool. With so many incredible facilities available at the Gellert Baths, you're sure to have plenty to do, regardless of when you visit! How Much Does the Gellert Thermal Bath cost? The cost of visiting the Gellert Baths depends on the time of year you visit, in particular which season as well as the days of the week. You can choose from daily tickets, or if you're a regular attendant of the Baths, you may prefer to invest in a season ticket. The spa is free of charge for children under the age of two; it's also important to bare in mind that the thermal spring water is not suitable for children under the age of 14. While at the Gellert Baths, you'll also have the opportunity to rent out towels, swimwear and life jackets. As well as purchasing the standard daily tickets for entrance to the Gellert Baths, you can also purchase various spa and medical treatments such as a mud-cure (1 600 Ft), Medical Therapy Massage (1 600 Ft) and Underwater jet massage (1 400 Ft), just to name a few. The Gellert Baths are open everyday from 6am to 8pm, every day of the week. You'll be delighted to know that they're also open almost 365 days of the year (excluding days when they are closed for maintenance work etc). The Gellert Baths are even open on public holidays such as Christmas Eve, New Year and Easter; so regardless of when you visit Budapest, you're likely to be able to experience the incredible Gellert Baths facilities and services! While the Gellert Baths might not be the largest in Budapest (that title is awarded to the Szechenyi Baths), they're still incredibly popular with both tourists and locals, with millions of people visiting the many pools and spa facilities each year. At the Gellert Baths, you can enjoy the use of the many indoor and outdoor pools, all differing in size and temperature. There are five indoor thermal pools to be enjoyed ranging from temperatures of 36°C - 40°C, one indoor swimming pool at a temperature of 36°C, one outdoor wave pool (26°C) that's open from May to October as well as two immersion pools (19°C) and one outdoor thermal sitting pool (36°C). With so many different pools to choose from, it's easy to see why you can spend endless hours frolicking in them and enjoying the many benefits that thermal spring water offers. As well as the many different types of thermal pools, the Gellert Baths also offer a vast range of spa services and facilities including a sauna, steam room, pedicures, beauty salon, sunbathing terrace and a selection of aromatherapy, Thai and thermal massages. When visiting the Gellert Baths, you want to make sure that you make the most of your time there, especially if you'll only be able to visit once during your trip to Budapest. With so many options of spa treatments, swimming pools and baths to indulge in while at the Gellert Baths, you should plan your visit accordingly, so that you can make the most of your time there. How much time you should spend at the Gellert Baths really depends on the type of experience that you want to enjoy. For example, if you just want to spend a few hours in the swimming pools, immersion pools and thermal baths then you won't require as much time there as if you want to spend the whole day enjoying various spa and medical treatments. There really is no set time that you should spend at the Gellert Baths; some locals in Budapest may only spend 15 minutes to half an hour there on a morning before work, whereas some tourists can spend the entire day at the Gellert Baths, using every possible facility that they can. Clothes to Wear, rent towels etc. The rules of clothing at the Gellert Baths is very similar to many other thermal baths in the world; you should ensure that you have decent clothes that cover private areas. Women are permitted to wear bikinis and swimming caps aren't a requirement in 9 of the thermal pools (but are required in the swimming pool). As long as you're appropriately and decently dressed, then your time at the Gellert Baths will be perfectly enjoyable. If you forget to bring your own towel, or just choose not to, you can rent towels from the Gellert Baths for a small rental fee. When it comes to considering what to bring with you when visiting the Gellert Baths, it really is quite straightforward. You'll of course need your money to purchase your ticket (that is, if you haven't purchased it online beforehand), your swimming clothes, towels, soap and shampoo, swimming cap and any food and drink you may require throughout the day. You don't have to bring your own food with you as there is a buffet available at the Gellert Baths but you may prefer to bring your own in order to save money and for convenience. The table below shows our recommendations for the best tours and tickets of the Gellert Baths. The criteria that we use in choosing the best tours is based on customer reviews and ratings, as well as ensuring the tours will offer you the best value for your money. "Excellent. Amazing massage and the Spa caters to all"
"Wonderful massage and pools with different temperatures! Great program!" "Such a relaxing day! Loved trying all the different baths and pools!" "Really nice and super relaxing!" "We had a great time and even think of going back"
"A special day to be remembered forever"
"Calm, relaxing atmosphere in beautiful building"
"The Gellert Spa was marvelous"
"We enjoyed the music of the Hungarian music ensemble on board"
"Massage was great! Baths and pools were well maintained." "Spend a beautiful day at Gellert Spa…"
"This is a must visit and participate experience"
"Amazing area to relax and swim. Highly recommend." The Gellert Baths in Budapest are truly one of the most amazing ways to spend a day while in the Hungarian capital. Whether you spend just a couple of hours there, or you opt to stay all day, you're sure to enjoy the relaxing and peaceful atmosphere that the spa offers. In order to get around when in the city, the Budapest Hop on Hop off bus tour can be a great purchase to make; you'll also be able to experience some of the very best free things to do in Budapest as well. While Budapest isn't necessarily an incredibly large city, especially compared to many other European cities, it's still a good idea to make sure you have one of the Budapest Tourist Maps to help you get around much easier.